Never kite-surfed before? Now is the best time to get started! Already an advanced level kitesurfer? Come out and enjoy! Kite Camp Lefkadi 2018 will be held in Lefkadi Surf Club for one week. Lefkadi is only one-hour drive from Athens, and six kilometers after the capital of Evia Island - Chalkida, which connects the island with the mainland with two bridges. Don't wait for too long! Just come and experience something unforgettable in Greece. Lefkadi Surf Club is the most known destination for wind related sports and the only organized Kiteboarding school on mainland Greece. The ideal wind conditions of Southern Evoikos gulf combined with the wide free of hazards sandy beach of Lefkadi make the place perfect for both learning and practicing kiteboarding. Lefkadi Surf Club offers unique wind conditions wether you are a beginner intermediate or advanced rider. Because of its geographical position in between the mainland and Evoia island,thermal wind blow almost daily after three. The strength of wind is 15 to 25 knots with side shore direction which makes the spot completely safe and ideal for practicing. The best kite sizes for Lefkadi Kitepark are 12 and 9 but often 7 meter kites are also used. Best wind directions are Southeast and East but the spot also works with South, Southwest and West winds. Alternatively, Liani Ammos is located 10 minutes' drive from Lefkadi beach and works with North and North West winds. Liani Ammos is an amazing place to learn kiteboard because of the swallow waters and the great meltemi wind conditions. Pretty much in the area of Lefkadi you can kite 85% of the days from March till mid of October. All necessary equipment for the duration of the lessons. Dessi is a passionate kitesurfer, wakeboarder, and yoga person, who joined the team of KiteGreece in the summer of 2017 as a coordinator and a host for both kite schools on Evia island - Surf Club Lefkanti and Royal Sands Marmari Surf Club. This surf camp is located in Lefkadi, Greece. 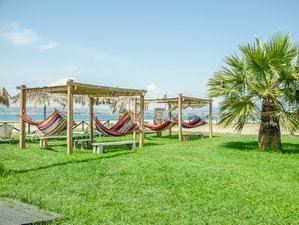 Lefkadi Surf Club is based just on the waterfront edge and 10 minutes walking from the picturesque village of Lefkadi. Highlight of the spot: the twin volcanos view while kiting and the volcano sunset view from the snack-bar of the kiteschool. Trekking, cycling, and winery visits are optional but are not included in the price.